Every year on Memorial Day we remember our fallen soldiers and their sacrifices in the service of our country. 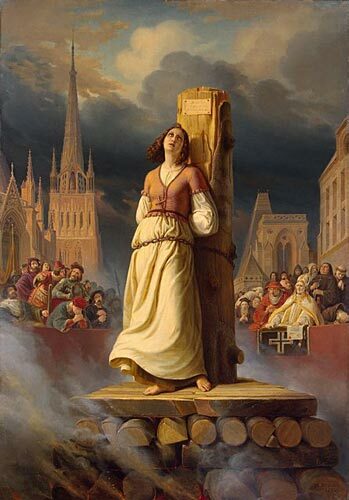 In much the same way I always remember St. Joan of Arc this time of year because the anniversary of her death is either on or close to when we observe Memorial Day each year. St. Joan was perhaps God's greatest soldier and her sacrifices in defense of her country and people exemplify what Jesus spoke of when he taught that "Greater love hath no man than this, that a man lay down his life for his friends." May 30th is the anniversary of St. Joan's death when she was burned to death at the stake by her enemies. It was a horrible way for Joan to end what was such a brilliant life of service to God and to her people. But even in the midst of this "horrible business," as one eyewitness later put it, Joan continued to serve God until the bitter end crying out the name of Jesus with her very last breath. The heroic way that Joan died was described by an eyewitness as causing everyone present including even some of Joan's enemies to have "recognized God's hand and made professions of faith when they saw her make so remarkable an end." The anniversary of the death of Saint Joan is celebrated each year by Catholics as her feast day which is a way to remember her life and service to God (The special page at MaidOfHeaven.com can be found at her Feast Day page HERE). Let us all take a moment this year to remember Joan and honor her for her service to God in the same way that we remember and honor all our soldiers on Memorial Day. Ultimately, Joan was fighting for God and gave her last full measure of devotion so that all of us are able to receive the true freedom offered only through God's son Jesus Christ.